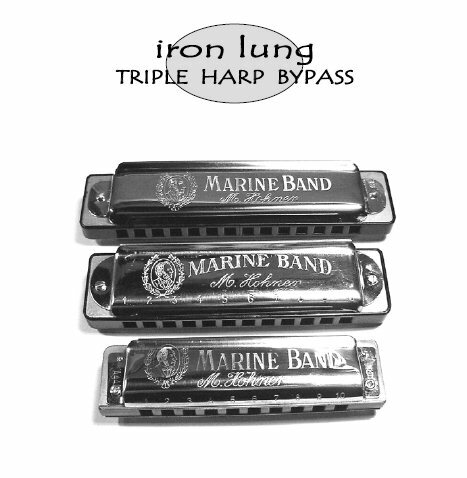 Iron Lung is a group featuring three of the most innovative and accomplished harmonica players around today. With stylish guitar backing, they perform traditional and original music in ways that challenge preconceptions of the instrument - and are guaranteed to put a big smile on your face at the same time. Rick lived and played in Ireland during the 70's as a founder member of the American/Irish band Pumpkinhead. Now chief of Hohner USA Accordion and Harmonica division, Rick holds patents on harmonica design and is a hugely respected 'reed doctor'. He favours custom-tuned diatonic harps, and is a fine tunesmith. Rick plays concertina and harmonica in a rack simultaneously, producing a massive, reedy sound that has to be heard to be believed. Equally impressive playing traditional Irish music on the chromatic harmonica or jazz-inflected original tunes on the blues harp, Mick is a subtle, versatile player of great natural talent. A former member of The Slightly Bewildered String Band, he is a world-class practitioner of the new 'overblowing' technique sweeping the blues harp scene, allowing this humble, supposedly diatonic instrument to be played fully chromatically. Brendan's acclaimed 1994 CD New Irish Harmonica established him as an innovative player fusing traditional music with the bluesy qualities of the harmonica to create a fresh approach that opened a lot of people's ears to the potential of the instrument in folk music. Known for his original tunes and custom harp tunings, he has recorded with Sting, James Galway, and Mary Black amongst others, and was a soloist in the Riverdance orchestra for 3 years. The pitiable character who has to endure the animated ravings of three obsessed harmonophiles by day, and then is still expected to play coherently at the gig. A brave but foolish man, Martin survives by making copious use of industrial strength earplugs whilst not on stage. A prolific composer of extremely catchy tunes and a deft arranger, Martin can play just about any style with ease.